Three days ahead of the first game, Bangladesh Cricket Board (BCB) probably thought they couldn't mess up a situation any worse when they offered a reluctant Shakib Al Hasan the captaincy for the series. The drama, momentarily, subsided when BCB chief Mostofa Kamal convinced the all-rounder to take up the job, but the trouble didn't stop there. Shakib was made captain after being named in the 15-man ODI squad for the five-match series, so he didn't have a say when the squad was selected, something of a prerogative for the captain. The first game saw the return of Mashrafe Bin Mortaza and Tamim Iqbal from injury while it was also another chance for Mohammad Ashraful to stake his claim in the World Cup team early next year. Apart from Tamim who got a harsh LBW decision after making a bright 44, the other two simply didn't make any impact. Ashraful's choice of shot was questionable, especially when Bangladesh needed him to stay at the crease in a crucial stage. Shakib staged a fightback on his own but the all-rounder's confused scoop in the dying stages gave Zimbabwe a surprise win, though their fielding had a lot to do in the Tigers' collapse. Four batsmen Junaed Siddiqui, Mashrafe Bin Mortaza, Sohrawardi Shuvo and Shafiul Islam were all victims of run-out and the visitors' work inside the circle was remarkable. Tall paceman Chris Mpofu was adjudged man-of-the-match for his three-wicket haul, his first award in a 6-year career. But what followed the match was stunning as Shakib launched an attack on team selection, especially the non-selection of two players Rokibul Hasan and Naeem Islam. He said that if the combination that lost the first one-day played again, Bangladesh would not win a match. Curiously, the board president said he agreed with what Shakib said and it was upto the No 1 all-rounder in the world to resurrect the series with the changes he asked for. The second game of the series belonged to Abdur Razzak however, the Khulna man becoming the first left-arm spinner in history to take an ODI hattrick, and the second spinner of all-time to do so. His five-wicket haul and Shakib's four skittled Zimbabwe out for 190 and Bangladesh reached their target with one of Shakib's changes, Rokibul, hitting a half-century. As I wrote earlier in the piece, the BCB thought they could not do any worse than the captaincy mess-up but it was about to get worse and worse. The third one-day was supposed to be a day-night game but as it turned out, the floodlights were not aligned properly, the lights mostly concentrated on the pitch and the 30-yard circle. Both teams agreed to play the day game and the ICC match referee Chris Broad sanctioned it the night before the game, but it was yet another example of BCB's inefficiency and miscommunication among itself. But that wasn't the end of it. Bangladesh won the third game to take the 2-1 lead, through Shakib's bat yet again, and it was also the welcome return to form for Mashrafe. 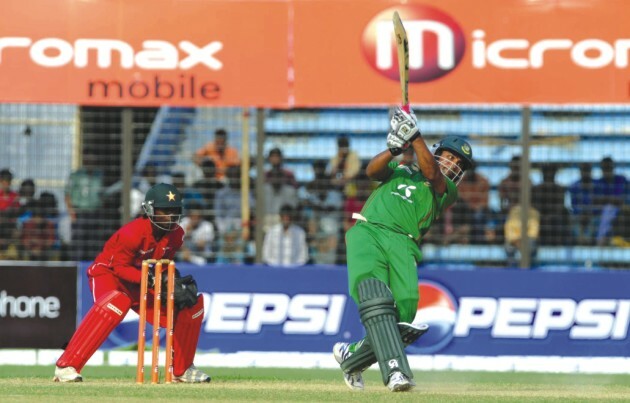 The Narail Express was in some pressure to keep his place but his effective spell made sure he held on to his spot. Such is the situation for a pace bowling spot in the national team now. The bandwagon (players, coaches, umpires, journalists and an endless number of BCB officials) moved to Chittagong for the finale of the series and though the first two days of training went smoothly, the day before the game saw heavy rain. The groudsmen were hard at work but a spell of rain early on Friday morning ended all hopes as water drainage facilities, of Zohur Ahmed Chowdhury Stadium are pretty bad. The ground had enough water for the game to be called off, the players avoiding to wear sneakers to the ground as it was so muddy. The fourth game cancelled, it was the Zimbabwean's last chance to level the series and they upped the verbal ante by calling it a nothing-to-lose situation for them. The ones who could lose it all were the national team and the cricket board, who made sure that even on the second last day of this tour, something had to go wrong. This time it was the sightscreen on one side of the Chittagong ground that came off and worse, it all happened when the ICC grounds inspection team were around. If a series had less in-field incidents than off it, this was it. But the Tigers stayed true to their form and simply destroyed Zimbabwe in the last game, winning by six wickets and making sure that for the last four series between the two sides, they had won all of them. Tamim was the hero in the last game, smashing a country record of seven sixes but missed his century in his attempt to do it all in one ball. The World Cup is the next port of call but the BCB are trying to arrange another team to tour Bangladesh to give the side some practice ahead of the tournament. Or are they trying to tell everyone that they can top the off-field shenanigans that happened during Zimbabwe series? Mohammad Isam is a cricket reporter.